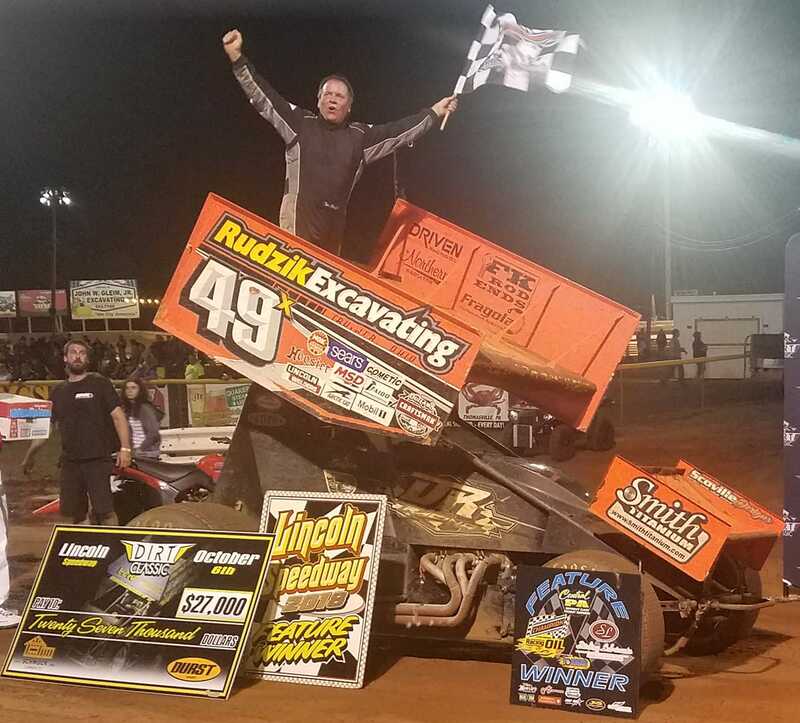 To say the “Steel City Outlaw” Tim Shaffer had a good night at Lincoln for the Dirt Classic 5 would be an understatement. Shaffer set quick time, won his first heat and landed in victory lane. After qualifying was completed the top points earner for the night was Trey Starks, earning him the pole position for the 40-lap feature. Last year’s Dirt Classic 4 winner, Lance Dewease, started on the outside of the front row. Shaffer and Brian Brown shared the second row as the field took the green flag. Dewease took the early lead as he ran the high line around turns 1 and 2 on the start. The first caution came early on lap 1. Lance held the lead again on the restart with Starks, Brown, Shaffer and JJ Grasso following in that order. The leaders caught the tail end of the field on lap 6. Dewease had been running the bottom and had to go to the top of the track to get through lapped traffic. Shaffer was all over Starks for second on lap 13 and was able to make the pass on the next lap. Grasso was running fourth when Shaffer made the move for second. JJ was on the move though and didn’t let Shaffer hold onto second long and took over the spot on lap 17. Just as Dewease had created some distance between him and the rest of field as they battled for position the red flag came out for a flip on the front stretch. Officials opened up the red for teams to add fuel. Dewease and Grasso went to the bottom of turns 1 and 2 on the restart and Shaffer went high. The bottom proved to be the quicker line as Dewease and Grasso held their spots. Dewease had racked up a 1.5 second advantage as the leaders crossed the line at the halfway point of the race. Lance’s lead was down to under a second when the caution came out again on lap 29. Shaffer made another attempt for second on the restart but could not get around Grasso. Five laps later, Shaffer got around Grasso for second and then one lap after that he went to the top of turns 1 and 2 to take the lead from Dewease. After Shaffer got around Dewease into clean air he ran away from the field. In an exciting finish Grasso got around Lance for second on the last lap. Shaffer crossed the finish line with a 1.866 advantage over Grasso. Dewease was third, Danny Dietrich finished fourth and Matt Campbell complete the top five. The Dirt Classic brings a unique race format to Central Pennsylvania. Points are awarded for time trials and two sets of heat races. The cars run the first set of heat races lined up based on time trial results and the second set is lined up in reverse. The top 20 drivers in points after time trials and heat races were locked into the main event. The remaining cars ran a B-main with the top 4 tagging the rear of the A-main. Shaffer was consistent all night from time trials to victory lane. Getting around Dewease on the high side of the track in turns 1 and 2 and taking the lead with five laps to go was the move of the race. Tim Shaffer set quick time over the 34-car field with a lap of 12.958 seconds. The first set of heats were lined up based on time trial results. The winners were Tim Shaffer, Trey Starks, Lance Dewease and Danny Dietrich. The second set of heats were lined up in reverse order from time trials. The winners were Jim Siegel, Lucas Wolfe, Chase Dietz and Tim Glatfelter. Lucas Wolfe won the B-main and was the hard charger in the feature, finishing 10th from his 21st starting spot. Lap leaders were Lance Dewease (1-34) and Tim Shaffer (35-40). Dan Shetler brought out the first caution of the race on lap 1 as he came to a stop in turns 1 and 2. The red flag came out on lap 17 as Freddie Rahmer flipped on the front stretch and collected Cory Haas. The final caution of the night came on lap 29 for Chase Dietz as he came to a top on the back stretch. Heat 7 Finish: 1. 4R-Chase Dietz; 2. 39M-Anthony Macri; 3. 37-J.J. Grasso; 4. 69K-Lance Dewease; 5. 33-Jared Esh; 6. 11-T.J. Stutts; 7. 5-Tyler Ross; 8. 4-Cap Henry. No Time. Consi Finish: 1. 24-Lucas Wolfe; 2. 15-Adam Wilt; 3. 5-Tyler Ross; 4. 4R-Chase Dietz; 5. 59-Jim Siegel; 6. 2W-Glenndon Forsythe; 7. 33-Jared Esh; 8. 49H-Bradley Howard; 9. 15G-Jordan Givler; 10. 73B-Brett Michalski; 11. 3B-Randy Baughman; 12. 21T-Scott Fisher; 13. 11P-Greg Plank; 14. 4-Cap Henry (DNF). No Time. Feature Finish: 1. 49X-Tim Shaffer ($27,000); 2. 37-J.J. Grasso; 3. 69K-Lance Dewease; 4. 48-Danny Dietrich; 5. 16-Matt Campbell; 6. 44-Trey Starks; 7. 21B-Brian Brown; 8. 11-T.J. Stutts; 9. 1X-Chad Trout; 10. 24-Lucas Wolfe; 11. 39M-Anthony Macri; 12. 88-Brandon Rahmer; 13. 15-Adam Wilt; 14. 87-Alan Krimes; 15. 99M-Kyle Moody; 16. 07-Gerard McIntyre, Jr.; 17. 1*-Tim Wagaman; 18. 4R-Chase Dietz (DNF); 19. 69-Tim Glatfelter (DNF); 20. 29-Dan Shetler (DNF); 21. 21-Brian Montieth (DNF); 22. 39-Cory Haas (DNF); 23. 51-Freddie Rahmer (DNF); 24. 5-Tyler Ross (DNF). No Time. Lap Leaders: Laps 1-34: 69K-Lance Dewease; Laps 35-40: 49X-Tim Shaffer.